If you have a bread machine, this raisin bread recipe is as easy as throwing in a few ingredients and pressing a button. It is so perfect in the morning toasted, with a little butter. Any leftovers you may have from this wonderful raisin and cinnamon bread would make delicious French toast or bread pudding, either one a real treat. In a medium sauce pan, scald milk over medium-high heat until bubbles form around the edge. Remove from the heat and stir in the butter and brown sugar. Transfer to the bread pan and let cool to lukewarm (between 86°F and 95°F/30°C and 35°C). Add salt and eggs to the bread pan. Spoon flour on top of liquid. Add wheat gluten, cinnamon and yeast. Place the raisins in the dispenser (or add at the "add ingredient" or "mix in" signal). Select the Basic/White cycle and the Light Crust setting and press Start. Makes 1 loaf. For a more delicate cinnamon flavor, decrease the amount called for by half. If your machine has a dispenser, check the manual for the correct operating instructions. If your dough does not form a ball during the first few minutes of kneading, do one of two things: if the dough looks dry and crumbly, add 1 tablespoon (15 mL) water at 1-minute intervals until the dough forms a ball; if the dough looks wet, add 1 tbs (15 mL) all-purpose flour at 1-minute intervals until the dough forms a ball. When you’re making the 1 pound (500 g) loaf, if you can’t find small eggs, beat 2 large eggs until blended, then measure 1/4 cup + 2 teaspoons (70 mL) to equal the volume of 2 small eggs, reserving any remaining egg for another use. To plump raisins for this raisin bread recipe, place them in a bowl and add enough hot water to cover. Let stand for 15 minutes or until plump. Drain well and let cool, then pat dry. Eating toasted raisin bread makes you feel just a little decadent with that slightly sweet taste and the soft sweetness of the raisins. Cinnamon and raisin bread has to be one of my favorites. This raisin bread recipe comes from a terrific new bread machine recipes book called The Artisan Bread Machine: 250 Recipes for Breads, Rolls, Flatbreads and Pizzas by Judith Fertig. Judith has written several wonderful cookbooks so it is no wonder her bread machine recipes should be so delicious. This recipe comes from an actual miller, someone who grinds wheat into flour. “People love my cinnamon and raisin bread recipe because it’s got a very soft, tender crumb,” says Alvin Brensing, the octogenarian miller in charge of producing Hudson Cream Flour, a premium all-purpose flour from Stafford County, Kansas. His home economist daughter helped him perfect this recipe. You can use less cinnamon if you prefer, but I love it with lots. If you like this recipe, I’d love you to Pin it to Pinterest, Tweet about it, Like it on Facebook and leave a comment and your own recipe below. 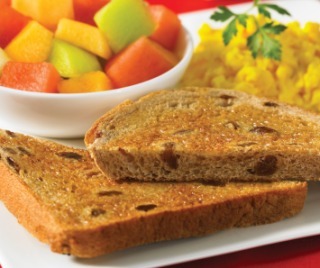 If you like this raisin bread recipe for breakfast you may also want to try another of our bread machine recipes – honey wheat bread.